Israeli cave explorers said Thursday that a salt cave with striking stalactites near the Dead Sea is the world's longest, beating the record-holder in Iran, AFP reported. The cave named Malham, stretching over 10 kilometres (6.25 miles), runs through Mount Sodom, Israel's largest mountain, and spills out to the southwest corner of the adjacent Dead Sea. Malham became known to researchers through the work of Amos Frumkin, founder and director of Hebrew University's Cave Research Centre, who in the 1980s mapped around five kilometres of it. 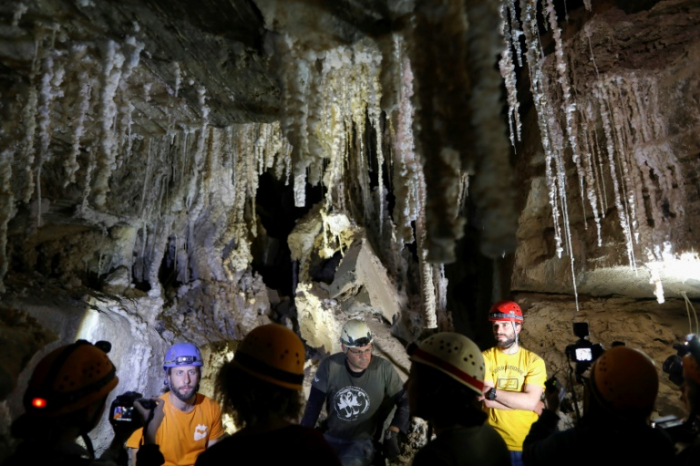 Negev, founder of the Israel Cave Explorers Club, joined forces with Boaz Landford, a researcher at the university's research centre, to organise a delegation of eight European spelunkers and another 20 locals. A second 10-day expedition in 2019 with 80 local and international spelunkers completed the measuring and mapping of the cave with lasers, determining its length at over 10 kilometres. Even in the short period of time since Frumkin's mapping, the cave's structure had changed, and would continue to do so. Much of the cave's interior is covered by a fine dust that blows in from the desert. Massive slabs of salt, some amber-coloured from dust and minerals, jut out to form dramatic installations. To Negev, Malham was in "a category of its own." "There's nothing like it in Israel," he said, claiming that no other cave came even close to the 10-kilometre mark. Negev pointed to its vast network of "caverns, passage-ways, piers, plateaus, one over another." He called it "the most impressive and complex in Israel ... and one of the most beautiful and fascinating ones I've been in." "The political rivalry creates a desire to connect and mutual curiosity," he said. "They're really excellent spelunkers." "I wish I could visit there," he said of Iran and its caves.